The above diagram of the ideal Stirling cycle shows how a displacer-type engine (gamma configuration) would implement the cycle. Note that the displacer and power piston operate independently. During the expansion and compression phases the power piston moves and the displacer is stationary. During the heating and cooling phases the displacer moves and the power piston is stationary. In the above implementation of the Stirling cycle, the power piston and the displacer are essentially driven by two cranks on a single crankshaft. The displacer leads the power piston by 90°. This simplification results in the loss theoretically of about one-quarter of the work. The engine shown in both of the above diagrams is a schematic diagram of my engine 3d. It has some simplifications. During a cycle the working gas moves between the hot and cold ends by passing through the narrow opening between the displacer and the cylinder wall. My original engine used this design. Later I added a regenerator by boring four holes vertically through the displacer, filling them with regenerator material, and creating a better seal between the displacer and the cylinder wall to force the gas through the regenerator. This modification doubled the engines power output by improving the rate of heat transfer. 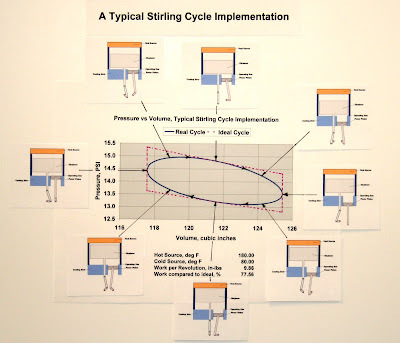 Why use the Stirling Cycle? The following diagram shows the theoretical maximum efficiency for the Carnot Cycle for some low temperatures. The isothermal expansion and compression would need to happen very slowly to maintain near constant temperature to allow for heat transfer. The regenerator would need to transfer heat efficiently without friction. At any reasonable gas flow rate through the regenerator the gas will experience friction losses. Ideal efficiency assumes all heat transfer is between the working gas and the appropriate heat source, cool sink, or regenerator. Any paths that take heat from the heat source to the cool sink and bypass the working gas are wasted energy and contribute to engine inefficiency. All the usual sources of energy loss including friction on bearings, moving seals, and airflow. 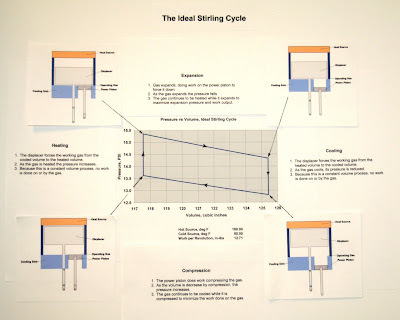 Some Stirling engine developers have measured efficiencies approaching approximately half of the theoretical efficiency. The most efficient engines have heat sources operating at much higher temperatures (over 1000 deg F) and very high pressures (over 1000 psi). One should keep all this ideal thermodynamic cycle discussion in perspective. Other thermodynamic cycles such as the Brayton cycle can also approach Carnot efficiency and have their advantages. For example, no one has figured out how to implement the Stirling cycle as continuous flow process, allowing use of axial flow compressors and turbines. The Brayton cycle is commonly used with turbine engines. Stirling engines are probably confined to lower-power systems (tens of kw) using pistons. Megawatt scale systems require an array of Stirling engines.